Love's Delight (LoveSpell): Building on a soft base of musk, this scent has middle notes of jasmine, peach, and berries. Top notes include orange, bergamot and mandarin. Based on the Victoria Secret perfume. Ingredients: Goat Milk, Water, cocoa butter, emulsifying wax, steric acid and a paraben free preservative, fragrance oil or essential oil. 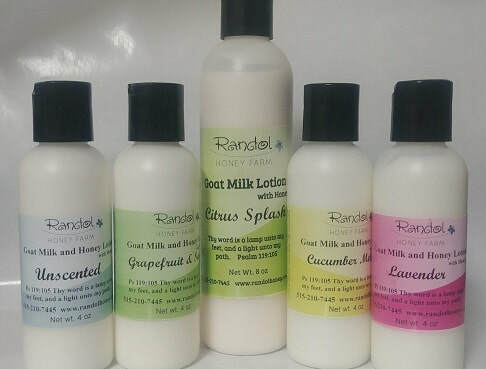 Try this Wonderful Goat Milk and Honey, Hand and Body Lotion. It will help to protect, and hydrate your dry skin as it goes on silky smooth and is non-greasy and absorbs quickly into your skin. All of our products are hand made in small batches from scratch using all natural products.